It was another cold and rainy night in Seattle, but the Shorecrest Performing Arts Center was warm and buzzing with anticipation as families, friends and neighbors filled the auditorium to hear the Cascade Youth Symphony Orchestra (CYSO) play a concert with the Seattle Symphony. 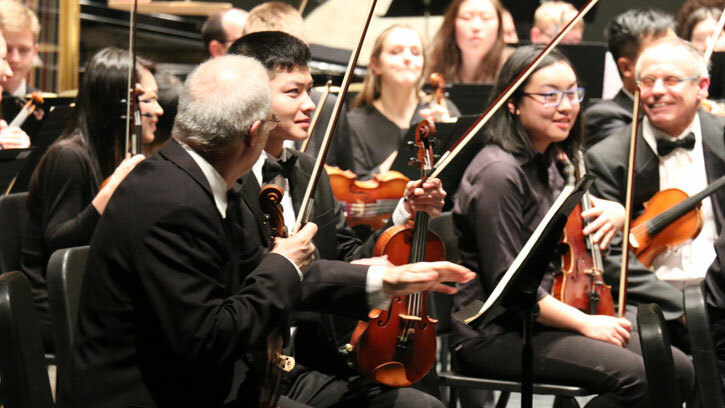 The opportunity for students to play side-by-side with professional musicians is an important piece of the educational process and an important part of the Seattle Symphony’s Community Connections program. Every year, the Symphony performs free Community Concerts in neighborhoods around the greater Seattle area to bring the transformational power of great music to everyone in our community. The concert on Tuesday, January 26 included a dazzling performance by the young violinist Yesong Sophie Lee of Pablo de Sarasate’s Carmen Fantasy. Lee, who made her debut with the Seattle Symphony when she was eight, is a finalist of the Seattle Symphony’s Young Artist Auditions. The program ended with a joint performance of Stravinsky’s The Firebird Suite, conducted by Seattle Symphony Assistant Conductor Pablo Rus Broseta. Judging by the smiles we saw in the orchestra, playing the climatic Berceuse and Finale from Stravinsky’s The Firebird Suite alongside Seattle Symphony musicians is something the CYSO students will remember for some time! You will have several opportunities to hear the Seattle Symphony perform in a neighborhood near you at upcoming performances at Seattle City Hall and with the West Seattle Community Orchestra, Garfield High School Orchestra, and Roosevelt High School. Community and Side-by-Side concerts are made possible with support from 4Culture, the Seattle Office of Arts & Culture and Seattle Symphony donors. Give now to support the Seattle Symphony’s community and education initiatives.